Hey Folks, I am back from a little vacation to a lake house in New Hampshire so it’s time to get back to business. 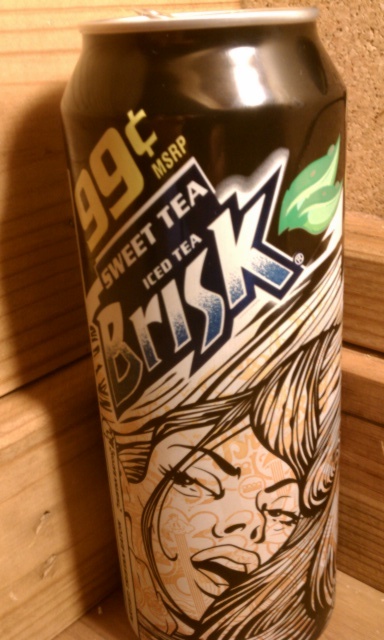 Today we have Brisk Sweet Tea. Sweet tea seems to be a fade these days with companies like McDonald’s, Popeye’s, and various beverage companies pumping out their versions. The packaging caught my eye in Shaws today and it was only 99 cents. The artwork seems somewhat suggestive and that isn’t even the best face on there. The other side looks like a demonstration of the fabled “O” face from Office Space. The explanation behind the new Brisk designs seems like its taking from Mountain Dew’s Green Label Art and having artists design do the grunt work for them. The taste just did not hold up to the artwork this time. It’s sweet but not too sweet but when I have a iced tea I look for that tea taste and this time I could not detect it. The usual tea tannins I comment are are lost in the mix. I have had better even with the Brisk line. Question of the Post – What’s your favorite tea? I really like the packaging on this!